This small city-state managed to reach an incredible level of development. Without any natural resources, Singapore has become a modern metropolis, which skyline is dotted with numerous skyscrapers. 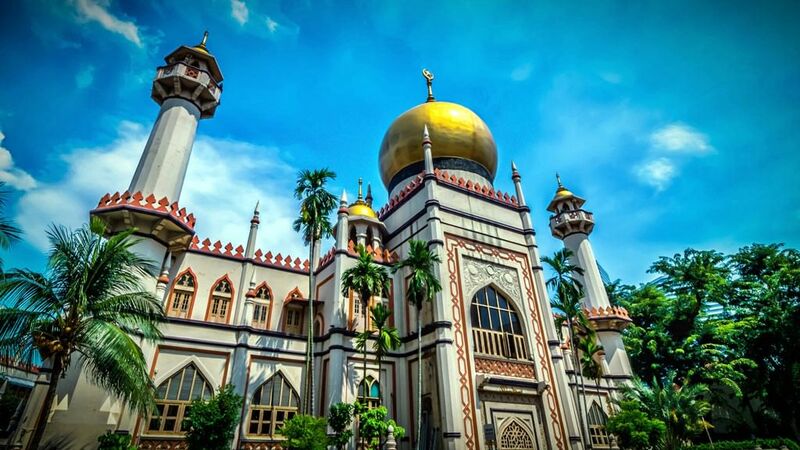 This is a truly universal place, so travelers will find there Chinatown, Little India and Arab Street. Gardens by the bay are a must visit attraction for every visitor in Singapore. This is a beautiful waterfront park that is divided into three parts – Bay East Garden, Bay Central Garden and Bay South Garden. Bay South Garden is home to the Flower Dome and the Cloud Forest. The Cloud Forest is a several story building with own artificial waterfall and environment close to natural cloud forests. In the Flower Dome travelers will find flowers and trees from all over the world. Sentosa Island is a great place to relax and spend some time away from busting city life. This theme park offers various entertaining activities including zip lining into the ocean, numerous rides, indoor skydiving, laser shows and sand beaches. The biggest theme parks of Singapore – Universal Studios and Underwater World – are also located there. A great way to enjoy panoramic views of the state is to take a ride on the Singapore Flyer, a ferris wheel that was the largest one in the world until 2014, when this title was won by the Las Vegas High Roller. There are several restaurants, shops and even a small garden near the ferris wheel. Finally, travelers with kids are recommended to visit the Singapore Zoo, which occupies the area of more than 28 hectares. More than 300 species of animals live in the zoo, including the largest colony of orang-utans in the world. 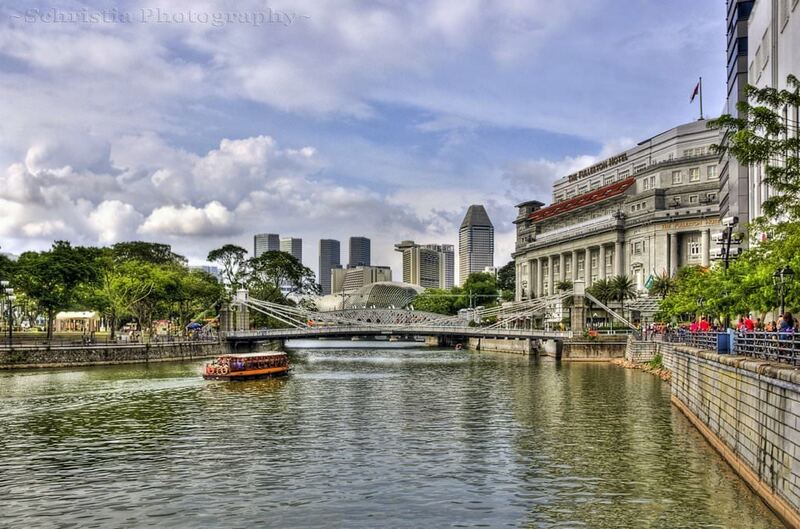 Singapore is notable for its eventful cultural life. During the year, decades of festivals and holidays are celebrated here. Fascinating celebrations are held on the day of the Chinese New Year. The main attribute of this holiday is breathtaking fireworks. In February, several interesting Hindu holidays including Pongal and Thaipoosam are celebrated. They always go hand in hand with exciting traditional rites, in most of which tourists can take part. In July, Singapore is visited by professional gourmets and cooks from all parts of the world. In this season, the traditional Singapore Food Festival is organized. Singapore is very popular with shopping enthusiasts. There are upscale shopping malls in its fashionable skyscrapers. Here, you can buy clothes, electronics, decorations and accessories from the most famous global manufacturers. The main shopping street in Singapore is the Orchard Road. The sale season lasts from late May to August. During this period, prices of many products go down to 50-70%. The summer period is the best time for shopping. This article about iconic landmarks and sights of Singapore is protected by the copyright law. You can re-use the content, but only under the condition of placement of an active link to www.orangesmile.com. One of the most popular sightseeing in Singapore is Masjid Sultan, built in 1928. The mosque has seen a number of reconstructions; however, it didn’t lose its original look. British architect Denis Santry has projected one of the most beautiful 4 100 square meters mosques in the world. 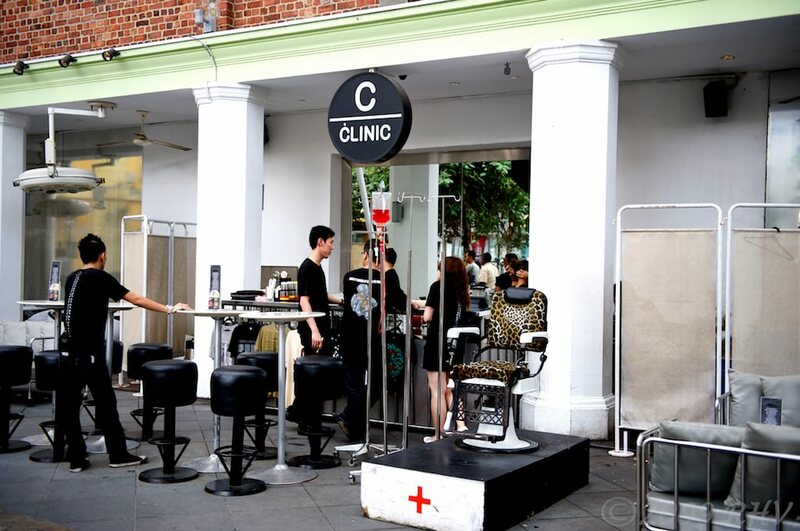 The "Clinic Bar" in Singapore will surprise you with its original decor and treats. The bar’s design resembles a real hospital. Instead of sofas you will find hospital beds, instead of armchairs – invalid wheelchairs. Original cocktails are given to the visitors not in shining glasses but in vails and drip bulbs. All like in a real hospital. This bar is very popular among young people and travelers. The first celebrates holidays there and the second choose it for a photo session. All the staff is wearing doctors' clothes, which impresses people more. The author of the design in this thematic bar is a popular artist – Damien Hirst. He is also known for his other outstanding works. The fashionable Marina Bay Sands hotel, located in Singapore, is a real world sight. In many respects it is due to its luxurious pool. The roof of this hotel represents a huge terrace with several levels on which besides the pools there is a landscape garden, spacious recreation areas, restaurants and bars. 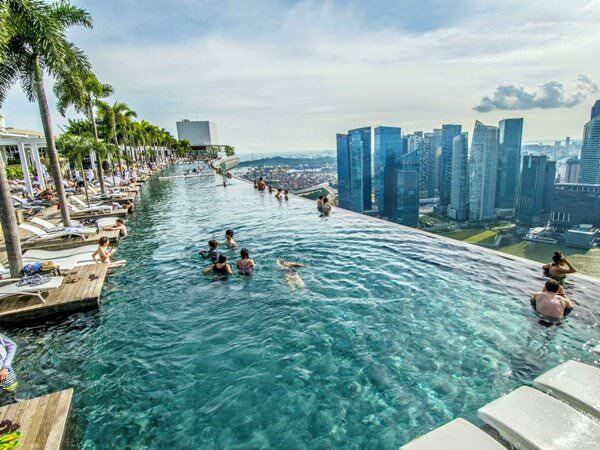 The main and the biggest swimming pool in the hotel is located on the 55th floor. During the water procedures, vacationers can enjoy the chic panoramic view of the city.